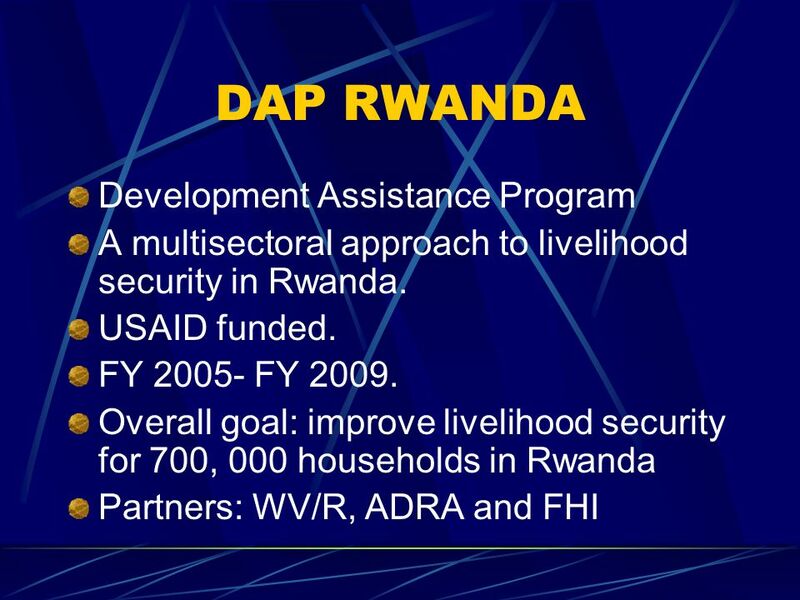 DAP RWANDA Development Assistance Program A multisectoral approach to livelihood security in Rwanda. 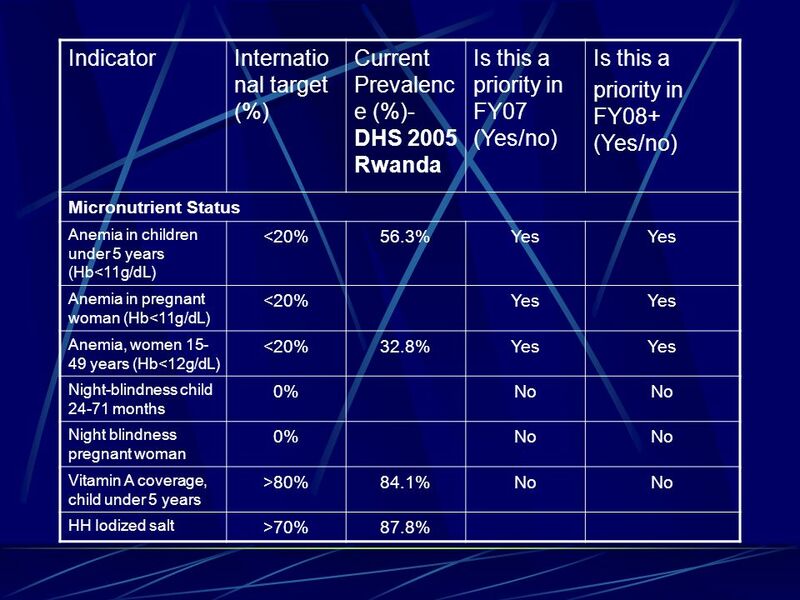 USAID funded. 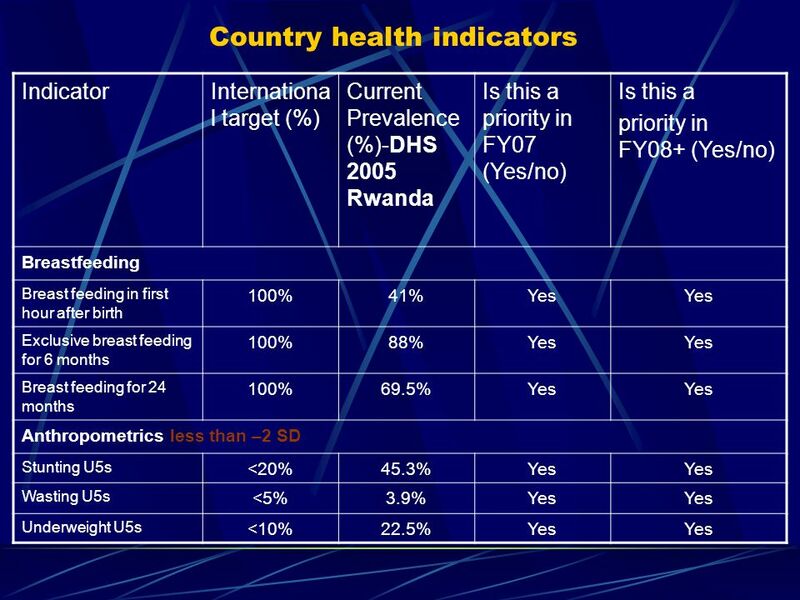 FY 2005- FY 2009. Overall goal: improve. 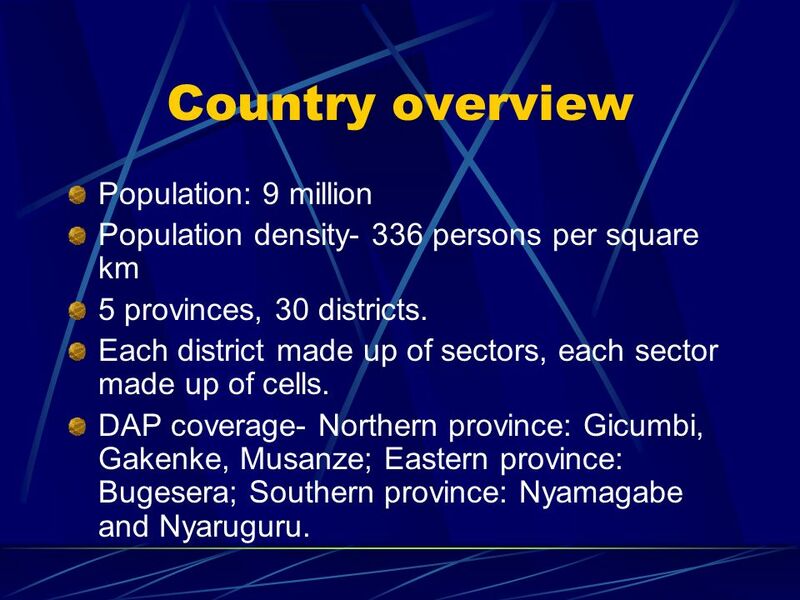 2 Country overview Population: 9 million Population density- 336 persons per square km 5 provinces, 30 districts. Each district made up of sectors, each sector made up of cells. DAP coverage- Northern province: Gicumbi, Gakenke, Musanze; Eastern province: Bugesera; Southern province: Nyamagabe and Nyaruguru. 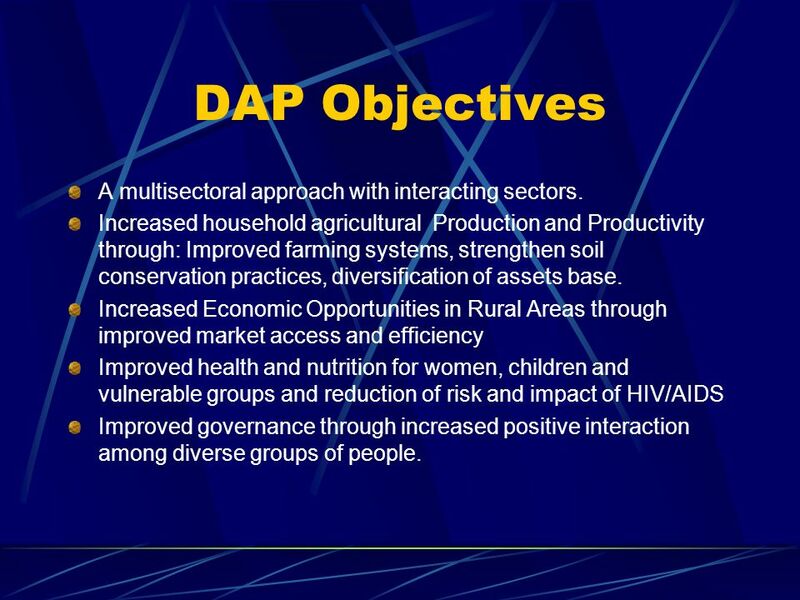 9 DAP Objectives A multisectoral approach with interacting sectors. 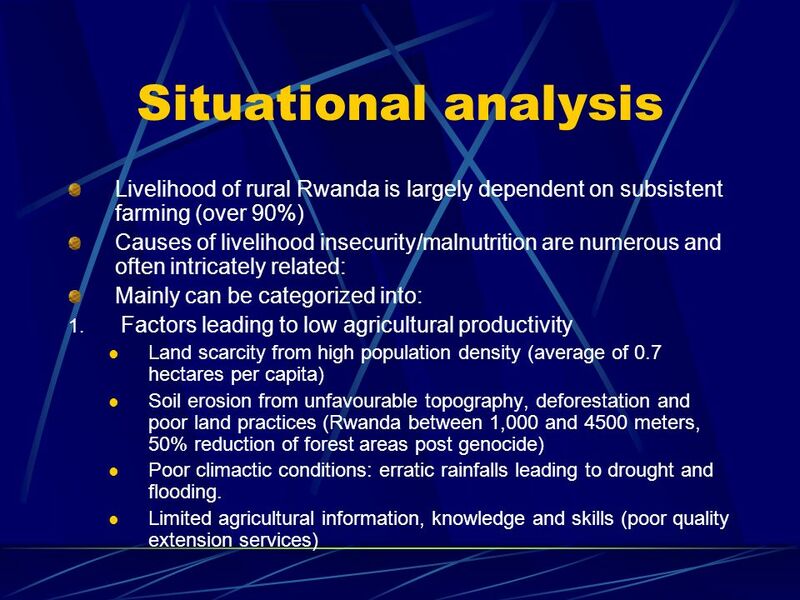 Increased household agricultural Production and Productivity through: Improved farming systems, strengthen soil conservation practices, diversification of assets base. 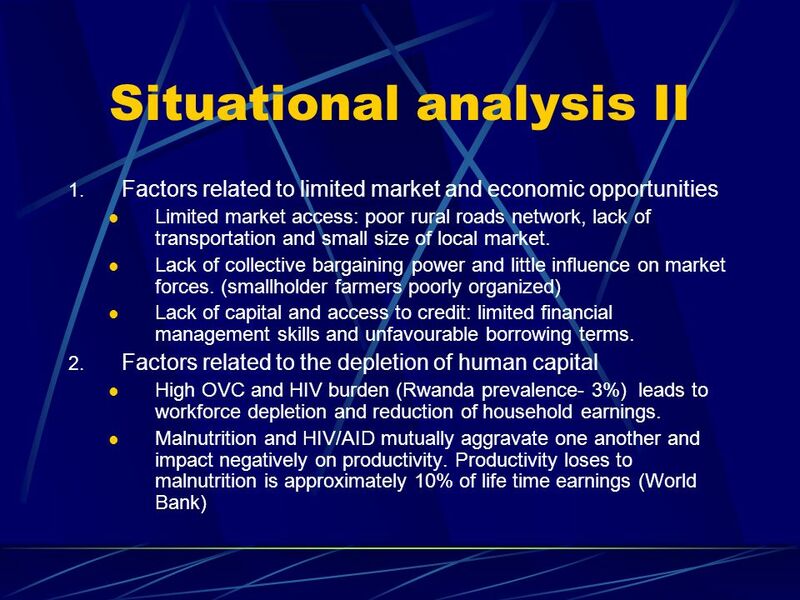 Increased Economic Opportunities in Rural Areas through improved market access and efficiency Improved health and nutrition for women, children and vulnerable groups and reduction of risk and impact of HIV/AIDS Improved governance through increased positive interaction among diverse groups of people. 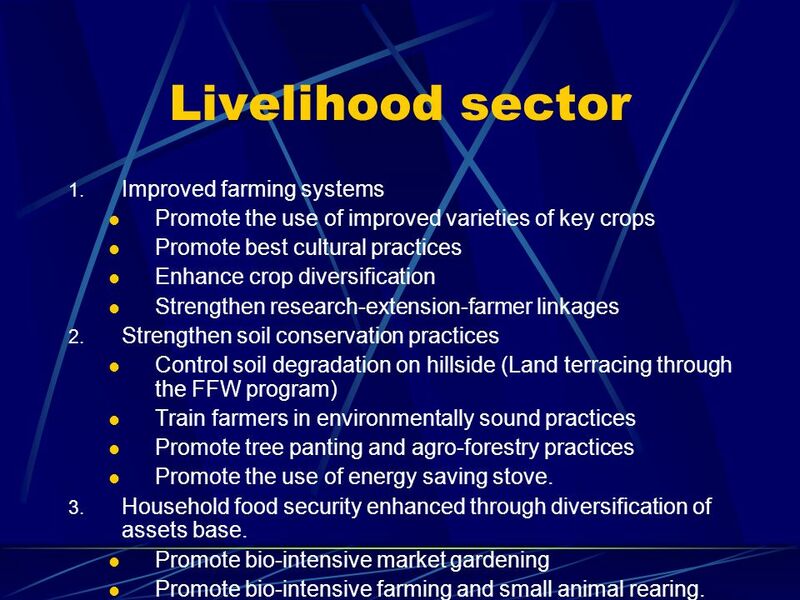 12 Livelihood sector 1. Improved farming systems Promote the use of improved varieties of key crops Promote best cultural practices Enhance crop diversification Strengthen research-extension-farmer linkages 2. Strengthen soil conservation practices Control soil degradation on hillside (Land terracing through the FFW program) Train farmers in environmentally sound practices Promote tree panting and agro-forestry practices Promote the use of energy saving stove. 3. 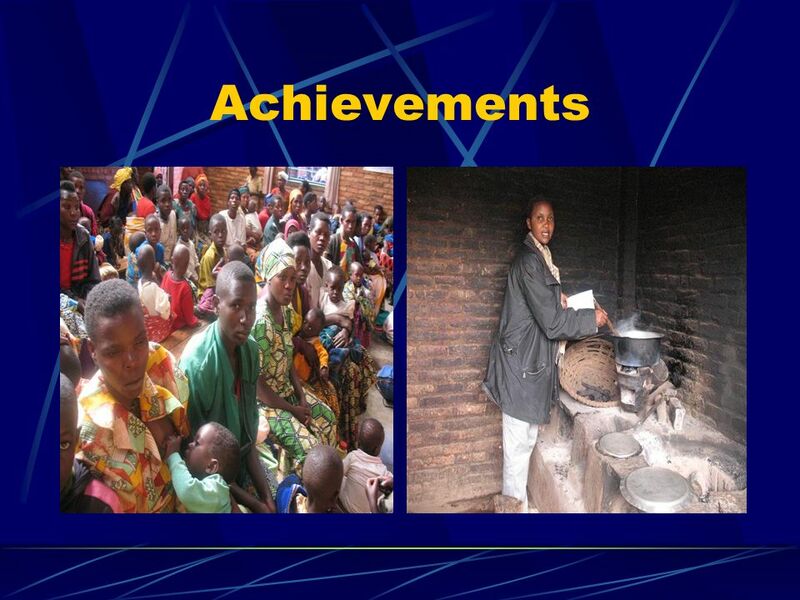 Household food security enhanced through diversification of assets base. Promote bio-intensive market gardening Promote bio-intensive farming and small animal rearing. 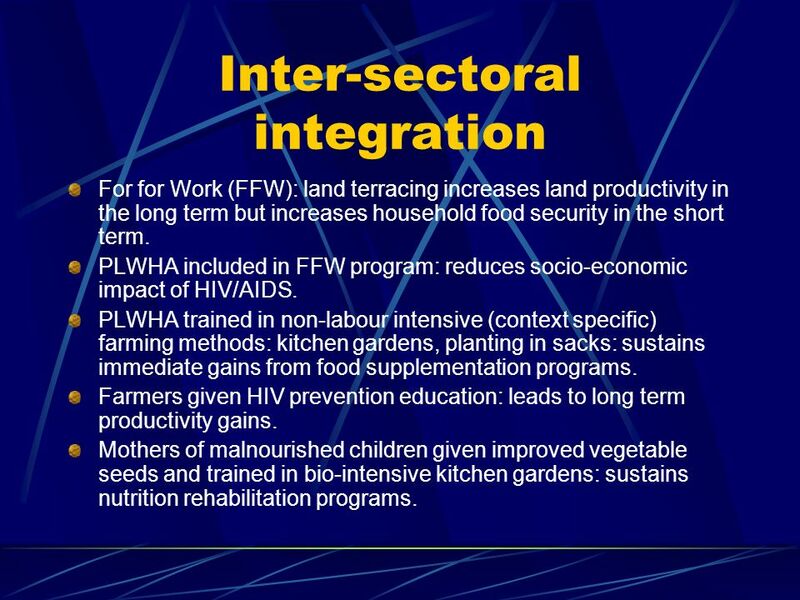 13 Inter-sectoral integration For for Work (FFW): land terracing increases land productivity in the long term but increases household food security in the short term. 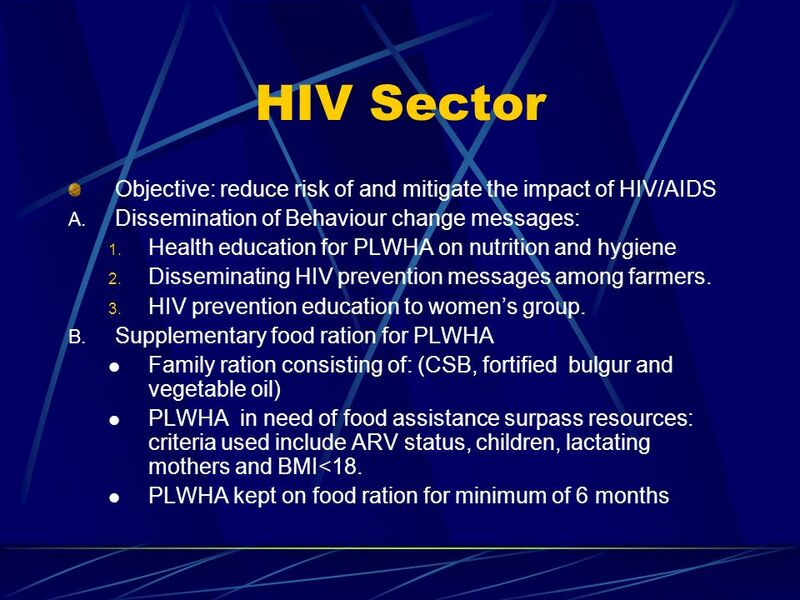 PLWHA included in FFW program: reduces socio-economic impact of HIV/AIDS. PLWHA trained in non-labour intensive (context specific) farming methods: kitchen gardens, planting in sacks: sustains immediate gains from food supplementation programs. 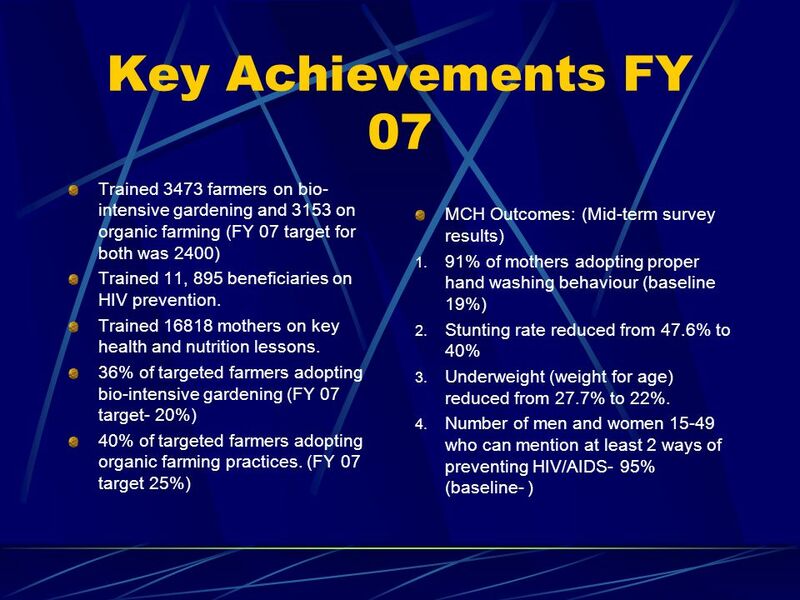 Farmers given HIV prevention education: leads to long term productivity gains. 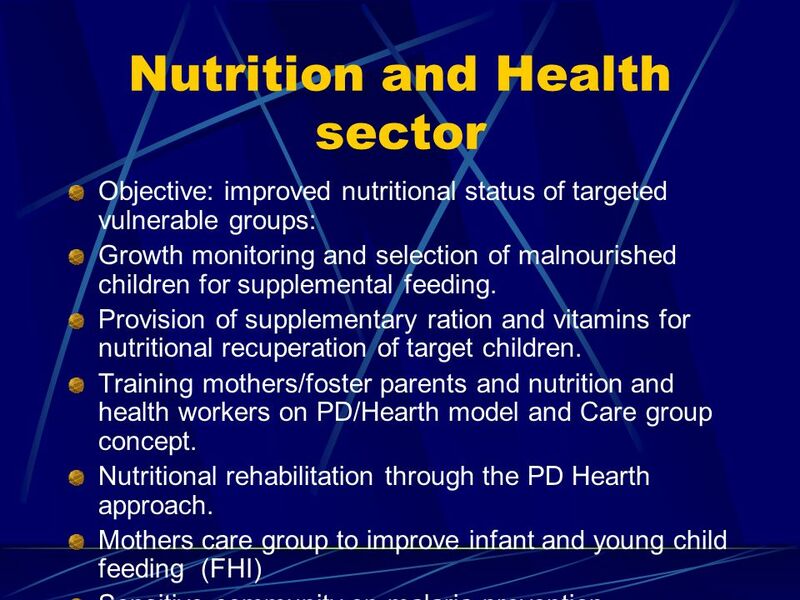 Mothers of malnourished children given improved vegetable seeds and trained in bio-intensive kitchen gardens: sustains nutrition rehabilitation programs. 17 Outcomes 2 (FGDs) 1. 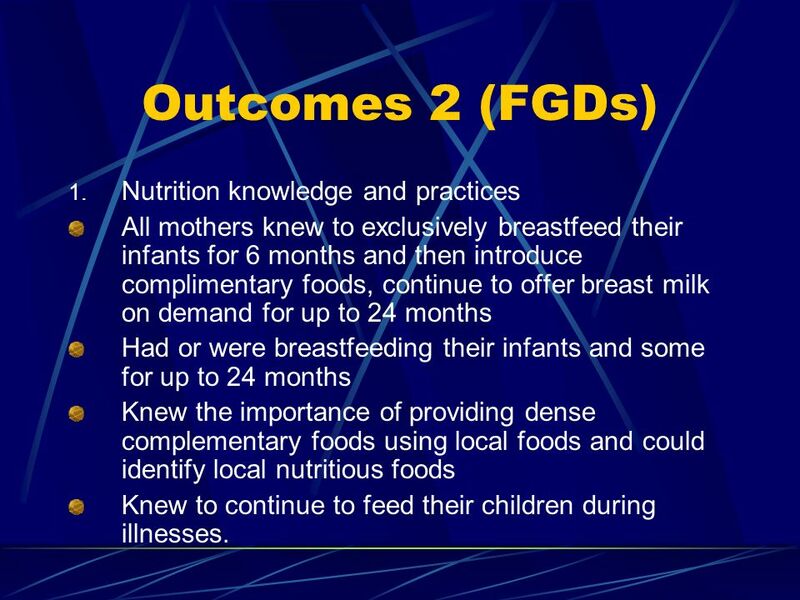 Nutrition knowledge and practices All mothers knew to exclusively breastfeed their infants for 6 months and then introduce complimentary foods, continue to offer breast milk on demand for up to 24 months Had or were breastfeeding their infants and some for up to 24 months Knew the importance of providing dense complementary foods using local foods and could identify local nutritious foods Knew to continue to feed their children during illnesses. 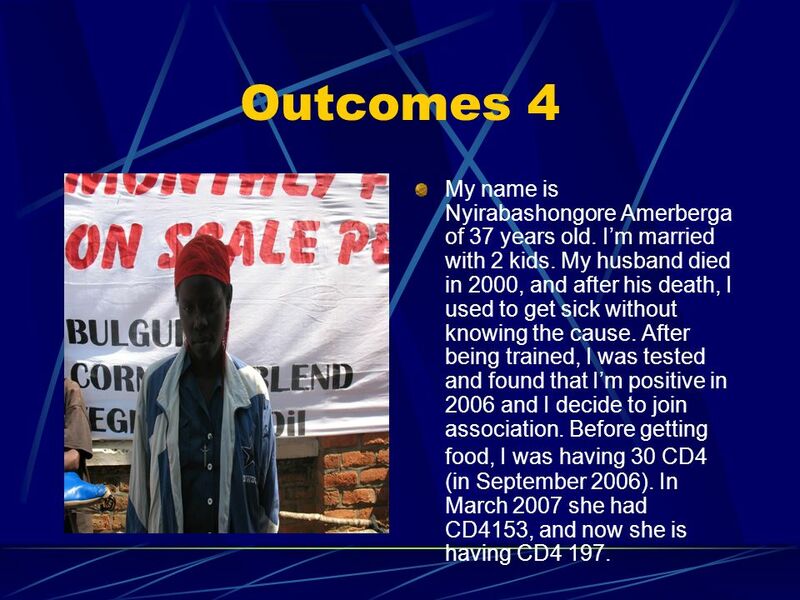 19 Outcomes 4 My name is Nyirabashongore Amerberga of 37 years old. Im married with 2 kids. My husband died in 2000, and after his death, I used to get sick without knowing the cause. After being trained, I was tested and found that Im positive in 2006 and I decide to join association. Before getting food, I was having 30 CD4 (in September 2006). In March 2007 she had CD4153, and now she is having CD4 197. 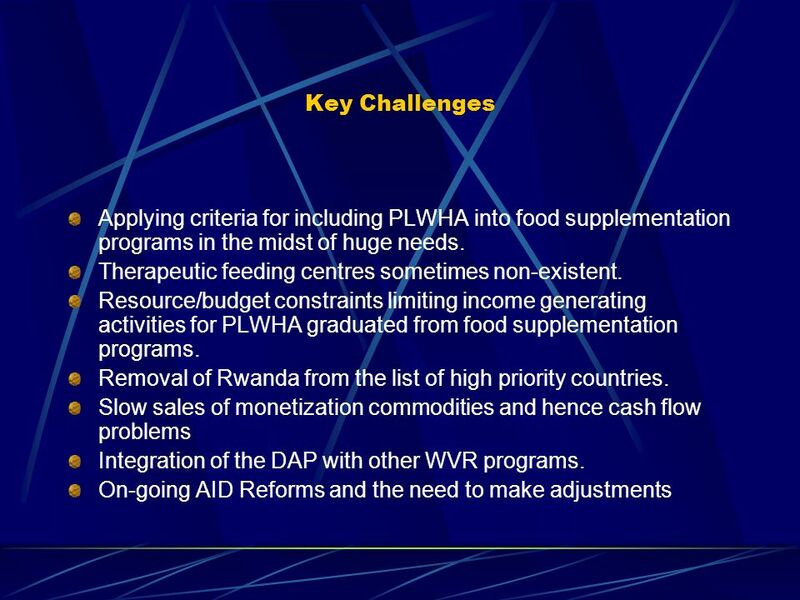 Download ppt "DAP RWANDA Development Assistance Program A multisectoral approach to livelihood security in Rwanda. USAID funded. 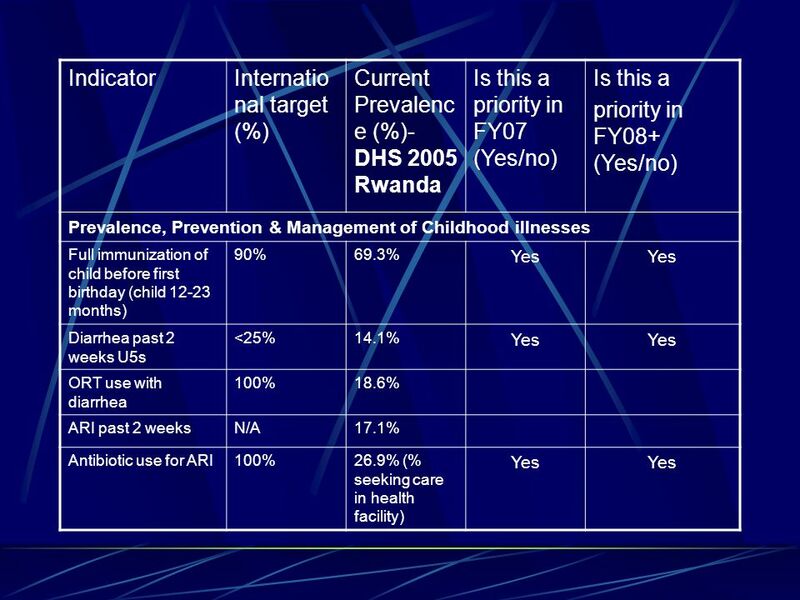 FY 2005- FY 2009. Overall goal: improve." Agenda Motivation and Overview (using Education as an example) Discussion by Selected Intervention Area Energy Services Hunger. County of Västernorrland Sweden Charlie Wallin. Facts 7 municipalities Population Inhabitants/km 2 = 11,2 2 Provinces 74% of the area is Forests. INTERGRATED RISK MGT ABDUL KYANIKA NSIBAMBI CENTENARY BANK UGANDA 2 nd April 2009. 1 Health Challenges in the Remote Mountain areas in Nepal in the context of food insecurity and poor health infrastructure Krishna Pahari School of Environmental. Bioenergy and Sustainability in Africa (COMPETE) Francesca Farioli, PhD CIRPS-Sapienza University of Rome. Central Eastern Europe and the Newly Independent States Promoting farmers’ access to markets in transitional economies. 2002 – 2006 Title II DAP Sofala Province, Mozambique. Diversifying Food Systems - Horticultural Innovations and Learning for Improved Nutrition and Livelihood in East Africa (HORTINLEA) A transdisciplinary. 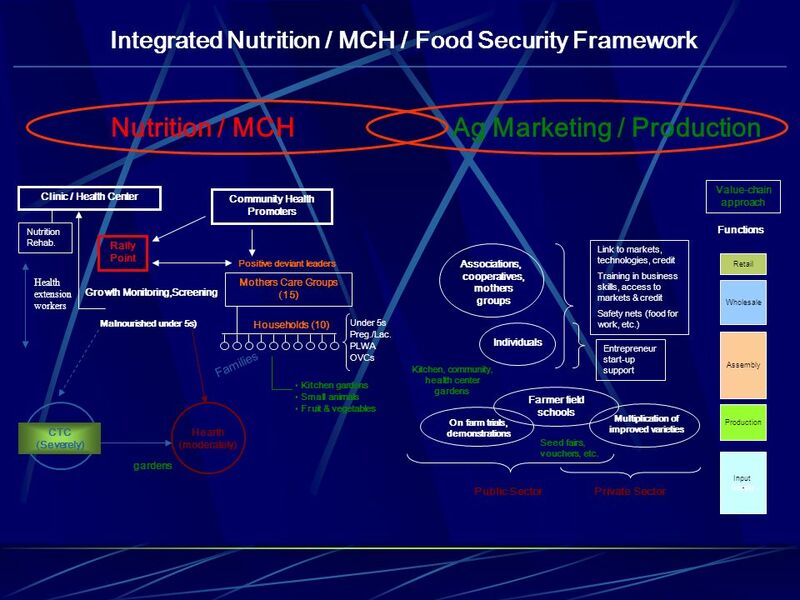 Session 7: Food Security and Nutrition Care and Support of People Living with HIV.